26 to 28 April 2019. Learn how to make and mix coloured clays to create designs and painterly effects that are rolled into slabs of clay. 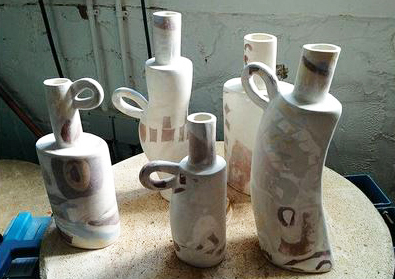 From these you will then create vessels, bowls and jugs ready for firing. 19 August 2019. Build simple forms from rolled slabs of clay. Using coloured slips decorate these with a variety of techniques including brushwork, printing, inlay, marbling, scraffito and feathering. Jane works at a studio in West Street Loft in Shoreham-by-Sea where she hopes to set up classes for adults and children. "...Jane Abbott's approach to her work...is honest, forthright and modest. But she has also hit an uncanny nerve with her artful, unproblematic wares, and has consistently sold well, whether working in the vessel form, or in the production of jewellery or more sculptural pieces. She does not rest on the laurels of past success; she does use her teaching to lead her to deliver new ideas, and finds in this work the proper balance of creativity. Teaching is a creative process for her, not a necessary chore." Copyright © 2019 Jane Abbott. All Rights Reserved.